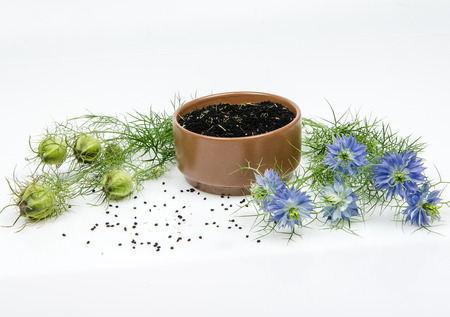 Nigella sativa, often called black cumin is an annual flowering plant in the family Ranunculaceae, native to south and southwest Asia.Recent studies on this incredibly powerful seed oil show it may be helpful in combating super bugs like MRSA or h.pylori and in cancer patients. There are now over 600 studies showing the effects of black cumin seed oil and there is promising research on the use of black cumin seed oil for dealing with autoimmune disease (which is why I’ve been experimenting with it). Its active compounds, crystalline nigellone and thymoquinone, are the most studied, but it also contains: myristic acid, palmitic acid, stearic acid, palmitoleic acid, oleic acid, linoleic acid, arachidonic acid, proteins and vitamins B1, B2,B3, calcium, folate, iron, copper, zinc and phosphorous.